Inbound marketing is all the rage at the moment. It is the notion that you get customers to come to you, rather than you go out and find them. That has been a “holy grail” for business for decades. Indeed, one of my favourite books is “Getting Business To Come To You” which was published before much of this Internet malarkey had been invented. Wouldn’t it be marvellous if people just discovered your business, that you did not have to go out and promote yourself? Just think of it – no more cold calls, no more trudging round door-to-door, no more dreary networking meetings, no more stale exhibition halls. Instead, you just sit at your desk and the phone rings and the online cash register keeps on going “ka-ching”. It sounds a dream world, yet many online businesses are discovering that you can certainly reduce your marketing efforts if you use “inbound marketing”, which means people come to you because they already know about you. But how? The answer to inbound marketing is simply adding content to your web presence. The more web content you add, the more frequently you do it, then the greater the chances of people stumbling across your stuff as they wander the web. But each time I talk to businesses about that they say “tried that, but it doesn’t really work”. Yet, I can show them examples of businesses who have turned their marketing department into an online publishing business and who have seen significant growth as a result. I can give them links to business blogs in tiny niche areas which have become the principal source of new business leads for those firms. Even so, business leaders still say to me “tried it, but it didn’t work for us”. That’s right – you are not going to start to see the benefits from any inbound marketing activity for around six months. 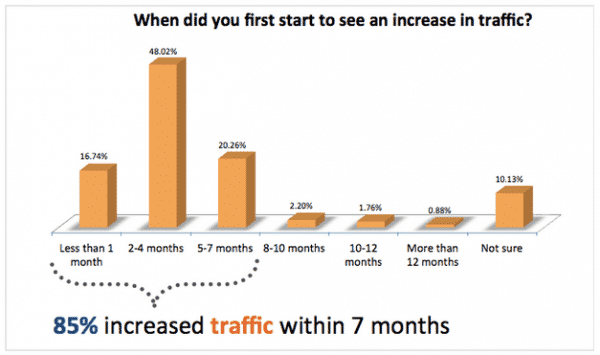 True, the study did show that 17% of companies did get more traffic to their website in a few weeks, but for 68% of firms it was 7 months before anything happened. That’s over 200 days of relentless, continual adding content before most firms see anything happen in terms of additional interest in their online business. Few business leaders want to wait that long. They are fuelled with the “instant” online world we live in and expect to see additional traffic and new lead generation within weeks, if not days. They want to see a return on their investment in content production far sooner than the back end of the year. The reason why so many businesses are saying “we tried that, but it didn’t work” is because they are giving up too soon. To be fair to HubSpot, they have always said that inbound marketing is a “slow burn” – indeed, they say they are surprised by the data, because it does show that some people do indeed get a rapid benefit from inbound marketing. The company has always preached patience. So, what do you need to do in order to get business to come to you online? Firstly, as the HubSpot research shows, the biggest benefit comes from blogging. And the companies who receive the most benefit blog EVERY DAY or MORE. So get your scribbling pens out…! Secondly, the research confirms that you need regular “calls to action” in order to benefit from inbound marketing. So, if you don’t know how to organise them, please contact me…! Oh whoops – there’s a call to action for you…! But whatever you do – be patient…! As this study shows, for the vast majority of people to benefit from inbound marketing it takes six or seven months. Inbound marketing is NOT a quick fix. But it certainly does lead business to come to you. Twitter beats Facebook and LinkedIn for B2B lead generation – or does it? Great post Graham, thank you! I can absolutely believe this insight too – the analogy that springs to mind is dropping pebbles in a pond. At first, there’s no hint of progress, except for some temporary ripples. But keep piling in the pebbles and eventually the pile of pebbles will breach the surface of the pond. But it can seem strange piling in the effort when nothing appears to be happening. Is it ‘Good To Great’ where they talk about the time involved in getting the flywheel turning?